Several people have inquired about the Mugsy case so here is an update. The family has NOT given up. While they have scaled back their efforts, anytime a sighting has come in of a cat in the general area, they’ve responded up there and either set a humane trap or camera. For the longest time they moved feeding stations (with cameras) or set traps. They’ve passed out flyers in different areas in the event that Mugsy has traveled and they’ve continued with the giant, neon REWARD LOST CAT posters, even replacing them after snow plows had knocked them over. 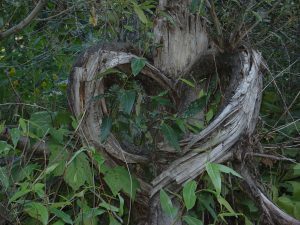 I was reminded of the heart tree, a sign of love and hope, located on the edge of the swamp where MPP first captured Mugsy on camera. Based on what I’ve seen from Mugsy’s family, that love and hope will never fade. Some have asked if I think Mugsy is dead (because of the snow) and here’s my thoughts on that. While Mugsy was a primarily indoor-only cat, she was allowed outside occasionally at her (snowy) home in Idaho. She was also an “accomplished mouser.” If Mugsy was not taken by a predator then yes, I think Mugsy could still be alive. After all, if cats could not survive in snowy regions then there would be no feral cats in areas like Alaska, Minnesota, or Maine. Look at Toronto, Canada – a very snowy and cold city. Toronto is estimated to have a feral cat population of 100,000 to 250,000 feral cats. So I really don’t see the snow as being something that would kill Mugsy. And finally, if Mugsy is out there we know she has a major food source – there are plenty of plump mice waddling around and birds who likely can’t fly anymore because they all feasted on countless bags and cans of cat food left out for Mugsy! So I personally believe that it is entirely possible that Mugsy is still alive and out there. The hardest part is not knowing. While we need to prepare for the fact that Mugsy might never be found, I’m glad that so many people have put their heart into her recovery. Rest assured that the family does have plans to continue with their efforts. They probably won’t be up there setting cameras during a blizzard, but the family is still responding to leads and to reminding people who live near Snoqualmie Pass to be on the look out for the stubborn Tortie. I’ve been a pet detective long enough to know this one true fact: MIRACLES DO HAPPEN!